Skyvision Centers is the place to get your sunglasses! Maximum ultraviolet light protection? CHECK! Sunglasses for your most active pursuits like biking and running? CHECK! How about the latest fashion to wear on vacation? YOU BET! need the right lenses and the right frames! If you're looking for more than an ordinary lens can offer, Transitions lenses may be right for you. Anyone who wears glasses or sunglasses (prescription or not) can wear Transitions lenses – we have options for every lifestyle, every age, and a number of different sports and activities. Transition lenses automatically adjust to changing light, becoming as dark as sunglasses when necessary. They provide convenient protection from several types of glare including the kind that can seriously diminish vision. In sunlight, mid-light, or indoors, they can be ideal for your everyday lenses. The newest Transition lenses are called Drivewear. 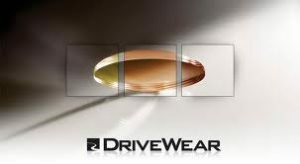 Drivewear lenses are simply fantastic technology! They are pretty much everything you would want in a pair of glasses for driving. First of all, they are polarized and cut down glare. Unlike most other lenses that won’t change color inside a car, the Transitions Drivewear will darken even behind a windshield! The lenses become a copper color in the car on a sunny day. This highlights reds and greens...you know, like the ones in street lights! As it gets brighter outside the lenses become a darker reddish-brown color. This provides maximum comfort and protection from excess light. We carry lots of different sunglass brands at Skyvision Centers. Whether you are lounging, racing, golfing, hiking, boating, we can direct you to the perfect pair! One of our all-time favorites is Maui Jim. 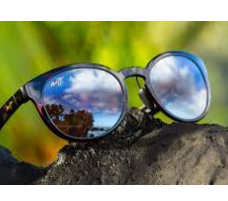 All Maui Jim lenses are polarized and have several specialized anti-glare filters to give you the clearest possible vision no matter what activity you are doing. Maui Jim sunglasses come in maximum vision enhancing glass lenses as well as highly rugged and impact-resistant sport versions. The Kaenon lenses have super high-quality optics with polarization and anti-glare filters in every pair. They are especially popular with athletes. 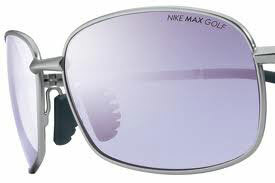 Nike MAX tint sports vision sunglass lenses are designed to only let the most important wavelengths of light make it to your eyes for your special sport. A great example is the Nike Golf Lens. This purple lens makes the white golf ball "POP" against the green background of a golf course so that you can follow your shots better. The other big advantage of wavelength measurement is how the Nike Golf Lens allows the golfer to see contours on both the fairways and the greens. You may have the perfect frames and want some new sunglass lenses...we can do that too, no problem! Everyone needs sun protection for their eyes and SkyVision opticians and doctors will help you!